In the late ’60s and early ’70s, in a musical sweet spot somewhere between the compositional ambition and bombastic excess of progressive rock, the experimental weirdness of early jazz fusion, and the liquid light-fueled freak-outs of psychedelia, there existed a unique group of bands centered around the cathedral town of Canterbury in southeastern England. United more by a spirit and an aesthetic approach than by a distinctly recognizable musical style, the “Canterbury scene” encompassed a handful of core groups, with a number of other bands later coming into their orbit through personnel or musical links. I’ll be devoting several columns to this unusual blend of rock attitude, jazz improvisation, British whimsy and avant-garde artistic innovation. First up, I’ll introduce you to my favorite of the bunch, Caravan. Caravan’s original lineup. L to R: Hastings, D. Sinclair, R. Sinclair, Coughlan. 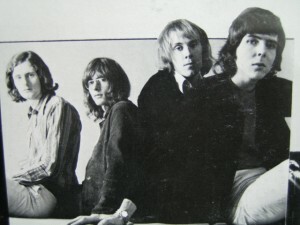 All four of Caravan’s original members (guitarist/vocalist Pye Hastings, keyboardist David Sinclair, bassist/vocalist Richard Sinclair and drummer Richard Coughlan) had been in the Wilde Flowers. Their 1968 self-titled debut was one of the last rock records released by Verve Records before it shuttered its rock/pop division to focus on jazz. Caravan was not just a solid and very enjoyable piece of late-’60s rock, but showcases the distinct appeal of Caravan right from the outset. 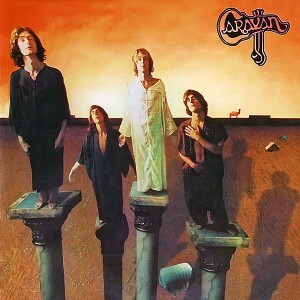 Check out “A Place of My Own”, which was many folks’ first exposure to Caravan by dint of being both the album’s first track and the lead single. The verse is quite pastoral, dominated by Hastings’ ethereal, reedy vocals and light guitar strumming, with the wonderfully catchy chorus getting only slightly more forceful. But then, at 1:30, the song flows quite naturally into something very different. The following minute—a full quarter of the song!—is actually pretty heavy (by 1968 standards), with Richard Sinclair and Coughlan laying down the kind of funky boogie that would be Caravan’s favorite platform for jamming over the next several years. It grooves, it cooks, and once Dave Sinclair’s organ starts its solo proper (at 1:45), it’s a kind of music you won’t find anywhere else. Too jazzy for rock, too groovy for psychedelia, too ballsy for jazz. Only Caravan sounds like this. And that was just the opening salvo. They soon got signed to Decca’s Deram Records label, and a slew of unforgettable albums followed. One Caravan trademark that soon appeared in their repertoire was the multi-part jam suite. Instead of slotting the solo between the bridge and the third verse the way a traditional pop song would do, they made the instrumental sections huge and segmented, changing the groove every few minutes to keep things moving, with vocal sections present only as bookends or accents. My favorite example of such a track is “Can’t Be Long Now / Françoise / For Richard / Warlock” from 1970’s If I Could Do It All Over Again, I’d Do It All Over You. Much like “A Place of My Own,” it starts out with a floating, song-like part featuring Hastings’ guitar and vocals, but three and a half minutes in it moves into a propulsive, pounding jam, with Dave Sinclair and Hastings’ brother Jimmy, a saxophonist and flutist, trading off funky, bluesy solos for more than ten minutes. At least one such track would also appear on each of Caravan’s next four albums. The follow-up, 1975’s Cunning Stunts, found the musical zeitgeist of the decade overtaking Caravan. While it still offered some enjoyable music, the band had moved further down the guitar-rock path and tried uncomfortably (and unsuccessfully) to incorporate the R&B and proto-disco influences that were prevalent in the pop-rock mainstream at that time. And sadly, it was all downhill from there. Dave Sinclair left again in 1975, leaving Hastings (and his folky pop/rock predilections) as the creative force in the band, and the Decca contract also ended. Hastings and Coughlin, with a varied supporting cast, soldiered on through three further uninspired, unsuccessful albums, a short-lived reunion of the original lineup in 1982 (resulting in the album Back to Front), and finally called it quits in 1985. A decade later, Caravan reformed, and a variety of lineups have released a couple of new albums (The Battle of Hastings in 1995 and The Unauthorised Breakfast Item in 2003) and been mainstays of the nostalgia tour circuit. But those first six studio albums (Caravan through Cunning Stunts) stand as an enduring legacy of amazing music that has just gotten better on each listen for me. If you’re a fan of the famous bands of the late ’60s and early ’70s that had an adventurous streak—like, say, the Doors or Jefferson Airplane or Pink Floyd—give Caravan’s unique marriage of jazzy and heavy music a try and see if it doesn’t enchant you as well. Do you know any place where I can find the tabs, chords, any kind of notes of Caravan’s music? I was searching it unsuccessfully and found here; this is indeed a very nice and en detail introduction of Caravan. Kudos! Your best bet for music and tabs is Songsterr.com, which I know for sure has at least a few Caravan songs on it. Thanks for the compliment!